A small uncontrolled fire can quickly spread and become a threat to people’s lives and their property. Fires are common during the December to April period which is why we need to be extra cautious when starting a fire for braaing, lighting a candle, paraffin lamp or any gas appliance such as a stove. Uncontrolled fires also occur in winter months, when there's a need to keep warm. The Fire is Everyone's Fight campaign contains guidelines for using the posters with learners. It also includes suggestions for activities that reinforce the key fire safety and emergency preparedness messages. Minister Bredell says it’s vital to educate communities about fires and fire prevention and in particular children. The idea of the department’s Fire is Everyone's Fight campaign, is to help communities understand that fires can be prevented. Reducing fire injuries and deaths in informal settlements. Limiting other residential fire losses. Through the Fire is Everyone’s Fight campaign and the Basic Emergencies, Safety and Fire Education (BESAFE) programme, the aim is to raise awareness among children to create safer homes and communities. influence family members to take action to reduce fires. Read more about the BESAFE programme. 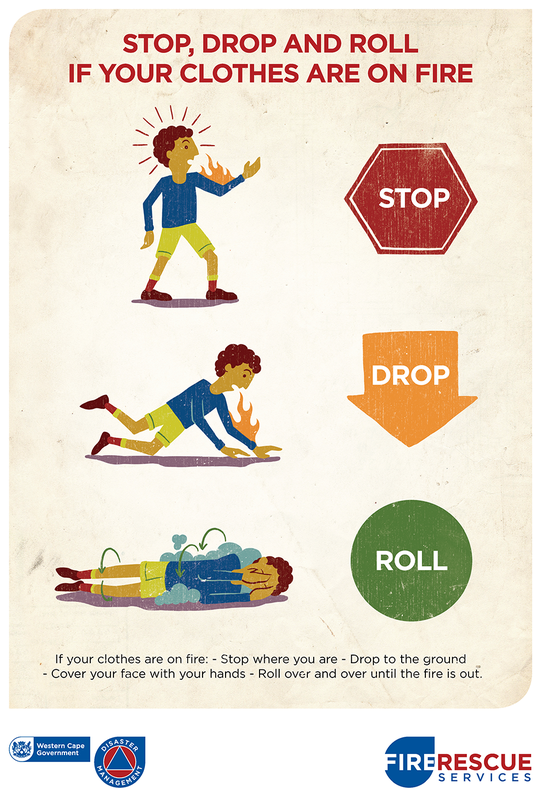 Should your clothes catch alight, make sure you know the Stop, Drop and Roll method to prevent the fire from spreading to the rest of your body. remove all your burnt clothing and check to see that it’s not still burning. know your emergency numbers to report veldfires in your area immediately. Warn people inside the house to get out safely. Help people to get out and stay out of harm's way. If there is a lot of smoke, crawl out below the smoke to escape the fire. Where possible, have more than 1 exit from your house, with clear routes to the door. The Western Cape Department of Local Government, Environmental Affairs and Development Planning has initiated an innovative smoke alarm installation programme for high fire risk communities. This new smoke alarm installation programme, is a key component of the Fire is Everyone’s Fight campaign, and you can read more about the campaign, or contact your closest local district municipality for more information on availability and costs for these smoke alarm systems. A fire needs heat, oxygen and fuel to survive. Without 1 of these elements the fire will die. If you don't have access to water or a fire extinguisher in order to put out a fire, you can use other methods such as sand or a wet blanket. If the fire occurs on your kitchen stove, try to smother the fire by placing a lid on top. Never use water to kill an electrical fire. It's also handy to keep a bucket of clean sand ready outside your kitchen door, or if possible, a small fire extinguisher. Keep a well-maintained fire extinguisher in your house and know how to use it. If you have no extinguisher, keep an empty bucket for water or a bucket of sand if possible. If you have a garden hose, keep it rolled up and ready for use in case of a fire. Where possible, have more than one exit from your house. Have an escape plan, and make sure that your whole family knows the plan. Don’t park in the way of a fire hydrant (and remind your neighbours and visitors to do the same). Cut candles in half to prevent them falling over and use a candle holder. Never leave an open fire – for example around a braai - unattended. Don't let open fires, such as a braai - get too big and out of control. Monitor weather conditions. If the wind is strong, rather put the fire out till the wind dies down. Open fires are a common cause of uncontrolled fires in the Western Cape. It's a good idea not to start a fire when it's hot, dry and especially not when it’s windy. Check with your local fire department before making fires outside. On certain days recreational fires will be prohibited, as indicated by the daily fire danger rating. This rating predicts the expected difficulty involved to put out runaway fires, and the higher the rating, the more dangerous the conditions are. The rating is your trigger to act, so to stay safe you need to stay aware of the Fire Danger Rating in your area. During the fire season, the Fire Danger Rating will feature in weather forecasts and be broadcast on radio and TV and published in some newspapers. The South African Weather Service provides a clear indication through its fire danger index map, of areas at risk of veldfires. Areas marked in red (76 to 100%) are extremely dangerous and areas that marked in blue (0 to 20%) are considered safe. Children should never be allowed to start a gas or wood braai or play near the braai area. Keep a braai well away from any surrounding vegetation or flammable materials, structures as well as children and pets. Protect yourself by wearing a heavy apron and an oven mitt that fits high up over your forearm. Always wear short sleeve shirts or roll your sleeves up when braaing. Never use a portable braai indoors, besides the danger of causing a fire in your home, it can also cause carbon monoxide poisoning. Never use a flammable liquid (for example: petrol, paraffin) to start a braai fire. Only use paper, kindling or store bought fire-lighters. Never use any kind of fuel to re-ignite or build up a fire-this is a dangerous practice. Soak the coals of a dead fire with water before you discard them, as coal can retain heat for long periods of time. If you have a gas braai, always store the gas cylinder outside and make sure that the valve is not leaking by ensuring that it is properly turned off when not in use. Before lighting a gas braai, check all connections with soap bubbles (use a soap and water solution). If bubbles appear at any connection when opening the valve, a qualified LP gas specialist must repair the leak before you continue to use the gas cylinder. Only use designated fire places and facilities in parks and recreation sites - they're designed to contain your fire in a controlled space. Children must never be allowed to make a fire without adult supervision. Never leave a burning or smouldering fire unattended. Never use candles, matches or gas stoves in a tent; it can burn within minutes trapping its occupants inside. Place your tent upwind and well away from a fire. Have a large container of water and a spade handy. When leaving the site or going to sleep, soak the fire with water and stir sand into the ashes or coals until every spark is out. Be careful of the hot steam and splashes when the water comes into contact with the coals. Fire is Everyone's Fight Radio Ad (Eng). Fire is Everyone's Fight Radio Ad (Afr). Fire is Everyone's Fight Radio Ad (Xhosa).